If you’re like most of us, you have that one coat or jacket hanging in the closet, soon to be forgotten completely. Or remember the blouse you bought a month ago, but wore only once? Or the tie that appealed to you so much in the store but is now lying wrinkled, still in the bag? 1. Work toward developing your style. Determine what you like best about your favorite pieces, and then try to replicate it. It could be color, style, fit, fabric, or any combination of these. ​2. Dress in what you love. Wear the clothing that you gravitate towards and optimize those particular clothing pieces. 3. If you’re going to spend more on certain articles of clothing, wear the clothing more often. ​4. Put some time aside to brainstorm ways to mix and match your clothing. This is a good way to plan ahead and develop wardrobe ideas and styles. You can always take photos of outfits you discover that you like, or jot down notes on combinations. ​5.. Don’t be afraid to remove the things you don’t want! If you find that you’re having doubts about an article of clothing, opt for donating it. 6. Wear your accessories more often and create an accessory corner for your closet. It can contain necklaces, scarves, belts and whatever else you wear often. Consider your closet environment an extension of your wardrobe. 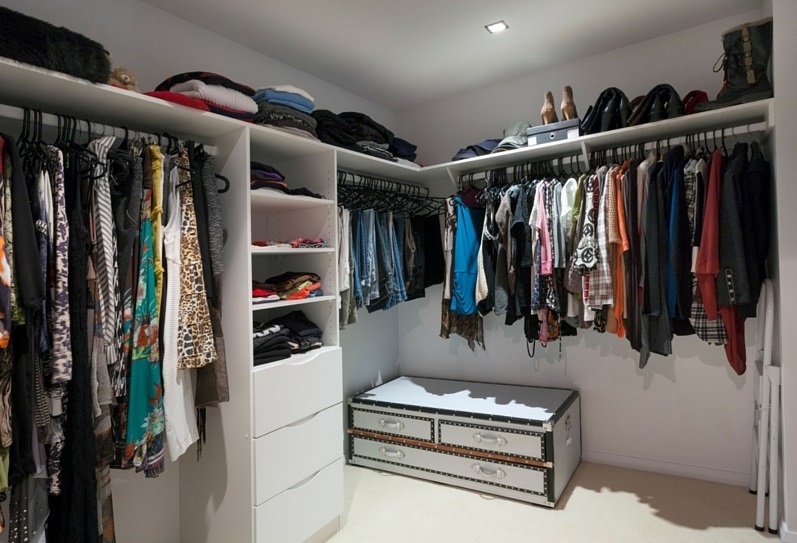 Make sure your closet is well lit and if it’s a walk-in closet that the floor is cleared. Try replacing dry cleaning hangers with plastic or wooden ones. I suggest putting all of your similar garments together, i.e. blouses, pants, jackets and keep them hanging in the same direction. I personally do not recommend the popular technique of turning the hanger around for garments you’ve worn. You know what you wear on a regular basis. By keeping your clothes organized, you’ll be able to quickly find what you need. There’s nothing more frustrating than not being able to find what you’re looking for in your closet! If you find that your clothes are wrinkled at the end of the day, try investing in a portable steamer or pants press, such as Jiffy Steamer or Corby Pants Press. You can also let your clothes air out by placing them on a chair or rack overnight. The winter months are a good time to start thinking about reorganizing and maximizing your closet. Think of planning ahead and developing styles for professional, formal, and casual settings as well as the new spring season. Any questions, you know who to ask!